On Tuesday, amidst the chaos of primary elections, photos surfaced that showed Republican frontrunner Donald Trump's campaign preparing to serve the candidate's own wine, water, and steaks at a press conference in Florida. Yes, you read that right: Trump has his own brand of wine, and he serves it as press conferences (or, at least, he did at this particular press conference). 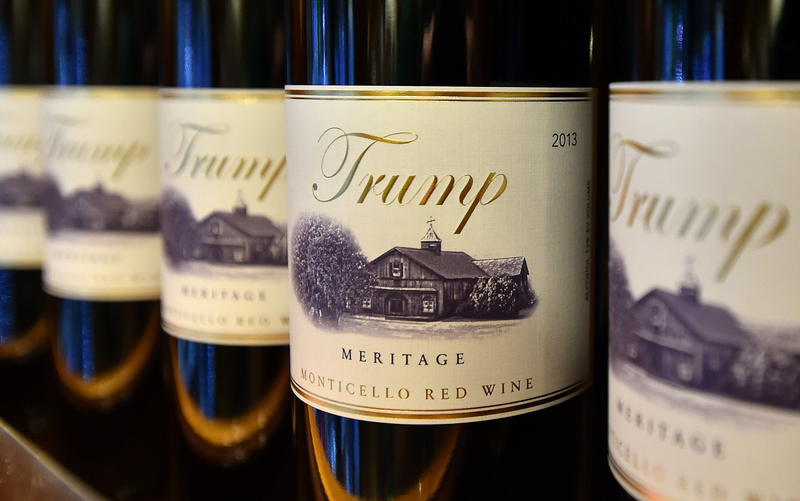 Regardless of how you feel about Trump as a candidate, you'll probably start to like him a lot more as a winemaker when you hear where you can buy Trump wine. Trump's wine comes from the not-so-subtly-named Trump Winery in Charlottesville, Virginia. It's a 1,300-acre estate near Thomas Jefferson's estate at Monticello (read into this what you choose). The vineyards were first planted in 1999 and the winery opened in 2011. True to Trump's style, it's the largest winery in Virginia, which boasts more than 250 wineries in total. Trump's wine selection includes sparkling, red, white, and pink options. Tastings are available at the winery in Virginia, but the wine is also sold online via the winery's website. Yes, you read that right, too: You can own a piece of the Trump business (and a piece of the wine business, no less) just as easily as you can own a pair of corgi socks. On the winery's website, Trump wine will cost you anywhere from $16 to $50 per bottle. You can also buy a wine tasting set for two for $68. If you don't want to buy it directly from the winery's website, Trump's wine is also sold on Amazon and other online wine marketplaces — because, well, of course it is. The Trump family knows nothing if not how to make a profit. If you're wary about supporting the controversial and outspoken presidential candidate, but you still need some wine that will make you feel fancy for your next girls' night in, I'll propose this small rationale: The Donald might not actually be very involved in the winemaking business after all. According to the Trump Winery website, Eric Trump — the candidate's third child and second son — is the president of the winemaking business. In fact, the business's true name is the Eric Trump Wine Manufacturing LLC. So maybe Trump's decision to serve his family's wine on Tuesday night was more of a favor to his son than a reminder of his far-reaching business power. Still, let it be known that the Trump family passes up no opportunity to remind the public about its business success. If and when you order Trump's wine, remember to enjoy responsibly — and to don your Drumpf hat first.